Phillip Neri was a 1500’s Italian priest noted for founding a society of clergy called the “Congregation of the Oratory” known for their music, called oratorios. All members of his order had to be over 35 years old (having lived a secular life) and were able to not only bring their money to the order, but could withdraw the same amount if they left. The order is also unique for having priests that stay at this church their entire lives, instead of changing their home church every few years as is normally practiced. 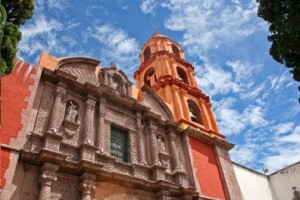 The 1712 church built by the indigenous in his honor here in San Miguel is the Oratorio de San Felipe Neri. The side entrance of the church features angels and saints carved with native features and was once the entrance for mulattos. This church features more indigenous art than any other church in centro. Prior to the church’s construction the site was home to indigenous worship for 250 years. The church features a chapel dedicated to Ecce Homo, the image of Christ about to be condemned to death by Pilate. Ecce Homo was the protector of the mulattos and venerated by the natives. Ecce Homo was also the patron of good times and widely popular both in town, and the countryside, from the 17th century until the mid 20th century. Inside, the church features 33 oil paintings depicting the live of Saint Phillip Neri. His feast day is celebrated all day with music, dancing, mechanical rides and fireworks at his namesake church near Plaza Civica. The local priest, Father Luis Felip Neri de Alfaro was named for this saint about 200 years after the saint lived. Fr. Alfaro studied at San Miguel’s San Franciso College and constructed the Oratorio, Atotonilco and the Holy School of Christ alongside the Parroquia. His bust is displayed in front of the Oratorio and it is easy to confuse this Mexican priest with the earlier Italian saint that shares his name.